A machine integrator needed electromechanical sub-assemblies for integration into an automated adhesive dispensing machine. This machine would be required to operate at a 100% duty cycle, twenty four hours a day, seven days a week. A three axis gantry style motion system was needed for moving the multiple head dispenser assembly (approx. 100 pounds) over a travel envelope of 800mm X 800mm X 150 mm. Independent motion programs would be required for applying different bead paths to various parts. 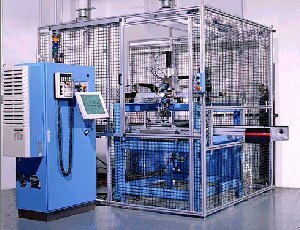 The customer would assemble, integrate and program the completed system which included the X,Y,Z gantry system, motors, drives, mechanical supports & fixturing, dispensing equipment, safety guards, and control panel. Daedal systems and products,offered at Selectable Levels of Integration, enabled a perfect fit solution to be found from standard catalog linear tables. Based on travel, load, throughput, and other performance criteria, the 400XR series tables were selected as the primary mechanical components for this three axis system. 406XR units comprised the X-X' & Y axes and a smaller 404XR was selected for the Z axis. Flexible options such as a cable management system, electric brakes, and inter-axis pinning simplified the integrator's efforts.